We like everything about the Super Bowl. The game. Delivering pizza. Unbiased surveys. Surveys? Oh, yeah. When asked what they like most about the Super Bowl, 9 out of 10 people said pizza delivery. The 10th person had been living under a rock for 39 years and had never heard of pizza delivery. “Seriously?” we asked the person who had been living under a rock for 39 years. 2019 marks our 39th year delivering pizza. That means we started delivering pizza when guys named Terry Bradshaw, Mean Joe Greene and Franco Harris were still playing football! 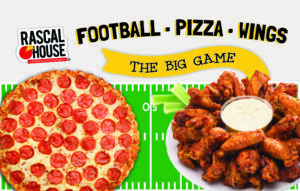 Tackle your ultimate Super Bowl experience by having everything on the Rascal House roster delivered to you in time for kickoff. Then share your Super Bowl photos with us on Twitter or Instagram using #RascalHouse, or post on our Facebook page!